The sharing economy might enable you to put a little extra cash in your pockets in your spare time, or it could be your primary source of income. Either way, earning money through ridesharing, homesharing, "tasking" or performing any other paid peer-to-peer (P2P) service will have an impact on your tax situation. What many people who participate in the sharing economy don't realize is that, in most cases, the money you earn is taxable. Because of that, there are steps you should take before earning your first dollar that will help you report your income accurately, take advantage of all the deductions (which reduce the amount of your tax liability) you may be entitled to and avoid an unpleasant surprise when you file your tax return. Your tax preparer is always the best person to turn to for information about what records to keep and how to minimize your taxes. But if you don't have a steady tax preparer or you want to complete your tax returns on your own, here are some tips and guidelines. 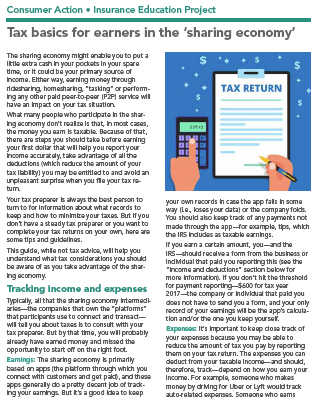 This guide, while not tax advice, will help you understand what tax considerations you should be aware of as you take advantage of the sharing economy. Typically, all that the sharing economy intermediaries—the companies that own the "platforms" that participants use to connect and transact—will tell you about taxes is to consult with your tax preparer. But by that time, you will probably already have earned money and missed the opportunity to start off on the right foot. Earnings: The sharing economy is primarily based on apps (the platform through which you connect with customers and get paid), and these apps generally do a pretty decent job of tracking your earnings. But it's a good idea to keep your own records in case the app fails in some way (i.e., loses your data) or the company folds. You should also keep track of any payments not made through the app. If you earn a certain amount, you—and the IRS—should receive a form from the business or individual that paid you reporting this (see the "Income and deductions" section below for more information). If you don't hit the threshold for payment reporting—$600 for certain types of income, and more than $20,000 and over 200 transactions for other types, in tax year 2018—the company or individual that paid you does not have to send you a form (though it might choose to), and your only record of your earnings could be the app's calculation and/or the one you keep yourself. Expenses: It's important to keep close track of your expenses because you may be able to reduce the amount of tax you pay by reporting them on your tax return. The expenses you can deduct from your taxable income—and should, therefore, track—depend on how you earn your income. For example, someone who makes money by driving for Uber or Lyft would track auto-related expenses. Someone who earns money by renting out a room in their home through Airbnb would track the costs of providing and maintaining that space. And someone who delivers things or does tasks for others might track things like gas, mileage, tools and supplies. All of these workers might track things like cell phone expenses, app fees (if any) and accounting software costs. Here are examples of the types of expenses you should track if you earn your income driving your car, having guests in your home or providing your labor. There might be others—always be on the lookout for deductible expenses! Track anything you think might be deductible—you can confirm the deductibility of an expense with your tax adviser or tax software later. In addition to keeping track of the amount of your expenses, keep receipts and other proof of them as well. Note 1: Ridesharing apps only track mileage driven while a passenger is in the vehicle, not miles driven between passengers, which are also deductible; you'll need to track these miles on your own. (Learn about tools for doing this in Money Talks News' "4 Mileage Tracking Apps That Can Help Reduce Your Tax Bill.") Miles driven from your home to your first client and from your last client back home aren't deductible. Also, when claiming deductions for business use of your car, you have to choose between claiming the actual expenses or using the standard mileage deduction set by the IRS. Depending on whether you own or lease the car and which method you start out using, you might be locked into that method for the duration. If you hire a tax preparer, ask him or her to advise you on the most beneficial method for your tax situation. Learn more in IRS Topic 510, Business Use of Car. Note 2: Depending on the type of asset (car, home or equipment), there are different guidelines for calculating depreciation, and some important long-term tax consequences to be aware of. Learn more in the IRS' "A Brief Overview of Depreciation" and TurboTax's "Depreciation of Business Assets." The goal of tracking your expenses is to reduce the amount of business income you have to report on your tax return. All the expenses that you can deduct would appear in detail on your return's Schedule C. Keep in mind that, when all the figures are in, you could have a loss (negative business income), but it can't be every year. The IRS has a rule that within the first five years of your business, you have to make a profit in at least three of them or the IRS will classify your business as a hobby. As a rule, you can deduct expenses that are both ordinary (common and accepted for your type of business) and necessary (helpful and adequate for your business, though not necessarily indispensable). To avoid increasing your chances of an audit, your expenses should also be reasonable for your business. Some types and amounts of deductible expenses are clear-cut—for example, the gas you purchase to take your paying passengers to their destinations. Others are not. For example, how much of your utilities can you deduct if you live in your home while having paying guests in just one of the rooms? Is the rent on a storage unit where you keep tools you use on the job deductible? Because you can only deduct expenses related to actual business use, you might have to run some calculations to arrive at the correct, allowable deduction. For example, if you rented out your home for 121 days of the year, you could deduct 33 percent of your annual expenses, such as insurance and utilities, plus specific direct expenses, such as the cost of having extra keys made or having the home cleaned between renters. If you rented out just one room in your home, the calculation would be more complex. You would have to first calculate the percentage of the residence you used as a rental (how many square feet the rental space is and what portion that is of the total square footage of your residence). That percentage is what you would multiply against every expense applicable to that particular rented room. Similarly, if you use your cell phone for both personal and business purposes (for the most part, sharing economy platforms run on apps, so this is a virtually unavoidable expense), you must calculate the percentage of time you use it for business in order to deduct a portion of your wireless service bill. Depreciation is a tax deduction that allows you to recover all or part of the cost of certain assets used to make money—like a car you use as a taxi or a home you rent out. To take a deduction for depreciation, you must first determine how much the asset was used for business if it is less than 100 percent. Because depreciation lowers the amount of tax you have to pay today by allowing you to "write down" (and deduct) a portion of the value of the asset each year over its estimated "useful life," you could end up having to pay more tax when you sell a home you've depreciated (called "recapture"). Consult with a tax professional to fully understand what the tax consequences would be if you were to sell the property. Learn more in SFGate's "What Happens When You Sell a House That You Have Depreciated?" and "Tax Implications of Not Charging Depreciation on a Rental Property." You will declare your business income and expenses on Schedule C, Profit or Loss From Business, when you file your Form 1040. Schedule E, Supplemental Income and Loss, is used to report income or loss from real estate rentals. Form 4562, Depreciation and Amortization, is used to report depreciation. A change in the tax law means that, starting in tax year 2018 (reported on your 2019 tax return), “pass-through businesses,” which include sole proprietors, contractors, freelancers and sharing economy earners, who earn less than $157,500 (single) or $315,000 (married filing jointly) can deduct 20 percent of their net business income from their total taxable income. Learn more about this new deduction from your tax adviser. Any forms due to you should be mailed by January 31 of the year after the income was earned. But even if you do not receive the form(s) or you earned less than the threshold amount(s), you still are required to report the income to the IRS. Underreporting your income can result in penalties and later tax assessments. Since taxes are not deducted from independent contractors' pay (withholding) throughout the year as they are for employees, you could get hit with a tax bill—and underpayment penalties—when you file your return if you haven't paid what you owe throughout the year. To avoid this scenario, and to comply with IRS rules, you might have to pay "quarterly estimated tax." As a general rule, if you're an independent contractor who expects their tax liability to be more than $1,000 for the year, the IRS expects you to make estimated tax payments throughout the year. It's likely your state tax authority will require estimated payments as well. Use IRS Form 1040-ES, Estimated Tax for Individuals, to calculate and pay estimated taxes. There also are online tools that can help, such as TurboTax's TaxCaster. Failure to pay on time can result in a penalty. You can make estimated payments online via the IRS' Direct Pay tool. For more information, read IRS Publication 505, Tax Withholding and Estimated Tax. Be aware that, in addition to income tax, independent contractors must pay self-employment tax, which consists of the full amount of Social Security and Medicare taxes owed (i.e., no employer match). Learn more at the IRS' Self-Employed Individuals Tax Center. The Rideshare Guy blog provides a wide range of practical information for Uber and Lyft drivers. Visit the “Taxes” page of the website to access a library of articles on tax-related topics for drivers. Presumably, this information will continue to be updated to reflect changes in IRS requirements and/or platform practices. A free and comprehensive educational module, including this publication and the Insuring yourself in the sharing economy consumer guide (available in English, Spanish, Chinese, Vietnamese and Korean), as well as training materials to be used by community educators, is available at the Consumer Action website.